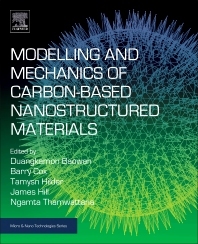 Modelling and Mechanics of Carbon-based Nanostructured Materials sets out the principles of applied mathematical modeling in the topical area of nanotechnology. It is purposely designed to be self-contained, giving readers all the necessary modeling principles required for working with nanostructures. The unique physical properties observed at the nanoscale are often counterintuitive, sometimes astounding researchers and thus driving numerous investigations into their special properties and potential applications. Typically, existing research has been conducted through experimental studies and molecular dynamics simulations. This book goes beyond that to provide new avenues for study and review. Barry J. Cox is Senior Lecturer in Applied Mathematics at the University of Adelaide, Australia. His research interests include nanoscaled oscillating systems, modelling nanoscale devices using continuum mechanics and predicting properties of nanomaterials using analytical techniques. He is a member of several professional bodies, including the Australian Nanotechnology Network. Tamsyn Hilder is a Lecturer in Computational Chemistry at Victoria University of Wellington, New Zealand. Her research focuses on computational biophysics of membrane proteins and nanomaterials, and the interaction between nano and biological materials. James M. Hill is Professor of Theoretical Mechanics and Group Director of the Nanomechanics Group at the University of Adelaide, Australia. He has previously written five books and published over 300 research publications in peer-reviewed journals. Ngamta Thamwattana is Associate Professor at the School of Mathematics and Applied Statistics at the University of Wollongong, Australia. Her research focuses on mathematical modelling in nanotechnology.